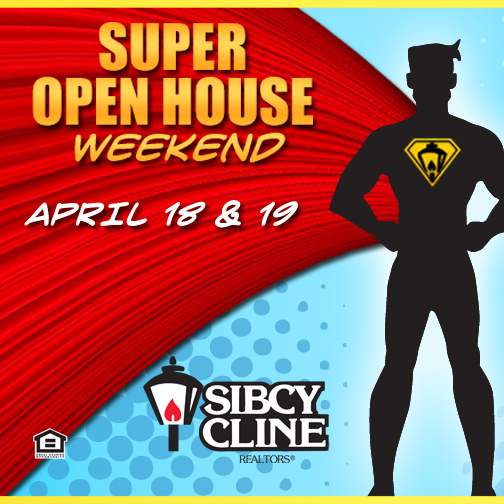 Sibcy Cline’s agents are hosting a company-wide super open house weekend on May 14 and 15, 2016. Plan on seeing some great homes throughout Cincinnati and Dayton, Ohio; Northern Kentucky; and Southeastern Indiana. Sibcy Cline agents have 307 open houses planned to date. See homes for sale here. The weather is expected to be in the upper 50s and low 60s – perfect for house viewing. It’s spring and time to look at homes for sale throughout Cincinnati and Dayton, Ohio; Northern Kentucky; and Southeastern Indiana. Make plans to look at homes on April 16 and 17, 2016 during Sibcy Cline’s Super Open House Weekend. There will be lots of homes held open for preview. Sibcy Cline’s website has had a tremendous amount of traffic of people looking at homes. On March 31, 2016, the website set a record with 54,922 visits in just one day. Look at homes for sale here. Sibcy Cline Super Open House Weekend – April 18 and 19, 2015! Is it a bird? Is it a plane? No, it’s Sibcy Cline’s Super Open House Weekend! Get ready, because Sibcy Cline’s agents are going to be holding lots of open houses on April 18 and 19, 2015. The forecast is predicting temperatures in the low 70s. It will be perfect weather to go out and look at homes for sale. Look at open houses here. Dress comfortably. You’ll be climbing stairs and touring homes inside and out. Think about your check list. What are you must haves in a home? Do sign in at the open house. You are entering someone’s private home and need to identify yourself. Ask questions about the house! The host agent is there to help you. Look past paint color, wallpaper and furnishings. Those items can be changed to your taste. Super! It’s Sibcy Cline’s Super Open House Weekend on February 8 and 9, 2014! Have cabin fever? Then get out and visit some open houses this weekend at Sibcy Cline’s Super Open House on February 8 and 9, 2013. Go here to be connected to open house information on Sibcy Cline’s website. Mortgage interest rates are still low. Home prices are just startiing to rise. Sibcy Cline’s Agents are looking forward to meeting you this weekend. Have fun touring lots of great homes!